Police have described the shooting of an 18-year-old man in County Antrim as a "brutal paramilitary-style attack". 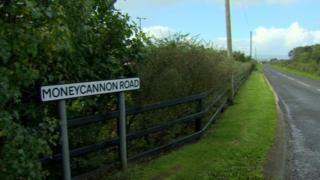 The incident happened at about 03:30 BST on Sunday at a house in Moneycannon Road in Ballymoney. The teenager was shot once in each arm and leg by unknown intruders. He was taken to hospital but his injuries are not thought to be life threatening. Insp Vince Redmond said it was an attack on a young man in his home by "dangerous and violent individuals". UUP councillor Darryl Wilson said the community was shocked by the news. "It's a very quiet, rural country area. It was a particularly brutal attack and we've seen a number of attacks in the Ballymoney area in last few years. "I think it's about time we had a serious look as to why these attacks are happening and what we can do to prevent further attacks," he added. Alliance Party MLA Stewart Dickson said this "scourge on our society must be addressed". "Far too often, those responsible for such attacks escape justice and there is a sense of impunity to their actions," he said.